This 90-minute contemporary production features non-traditional gender casting and calls forth the ever-present threat of losing democracy to ambitious rulers in an adaptation that highlights the timelessness of Shakespeare’s iconic work, particularly within our current political climate. 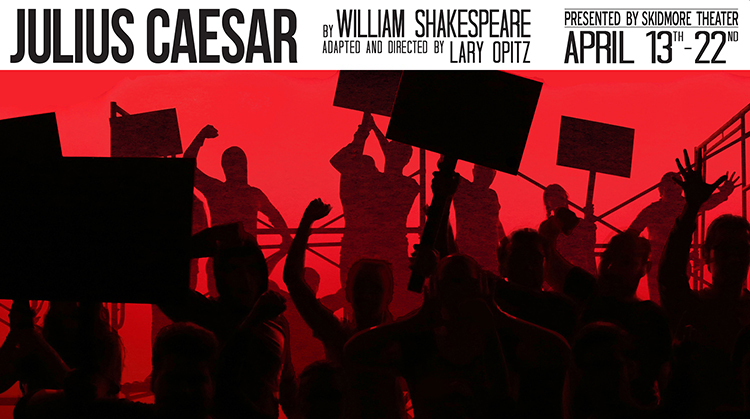 In Shakespeare’s timeless classic, Rome is divided – while citizens in the streets cheer Caesar’s rise to power, some senators fear the potentially dangerous consequences of Caesar becoming a powerful monarch. To protect the future of Rome, senators Brutus and Cassius spearhead a plan to publicly kill Caesar. After executing their plan, Brutus is forced to defend the assassination while Marc Anthony rouses the public’s sympathy by commemorating Caesar as a brilliant leader. The crowd becomes intoxicated with fear, rage, and greed as Rome is divided in a bloody civil war. "It’s not about Caesar. This much is clear," writes staff writer, Kallan Dana '19, as she covers Lary Opitz’s ninety-minute seminar adaption of the famous and timeless "Julius Caesar." Cheers to the opening night of our Spring Mainstage, Julius Caesar!